Football may be in Usain Bolt's future. The Olympic great says he might try his hand at the global game once he retires from track. Two days after saying he would like to defend his 100 and 200 meter titles at the 2016 Olympics in Rio de Janeiro, the 26-year-old Bolt says he may still branch out to other events. 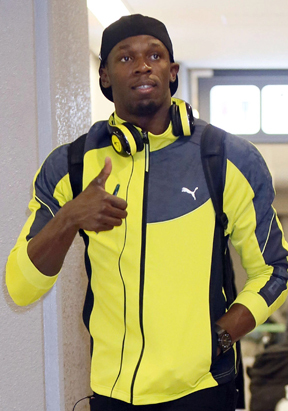 Usain Bolt, left, gestures on his arrival at Narita international airport in Narita, near Tokyo Tuesday, Oct. 9, 2012.